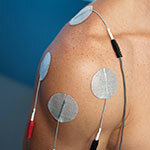 Electrotherapy is the use of electricity as a form of treatment for soft tissue injuries. Interferential is a form of TENS which uses two alternating medium frequency currents. The two currents are applied simultaneously and where they cross, form an area of wave interference which results in a modulated frequency equal to the difference in frequency of the two waves. Interferential stimulates the muscle in a way similar to a normal muscle contraction. It helps to reduce pain in the same way as TENS, using the pain-gate theory and also affects circulation. At low frequencies of 0-10 Hz muscle stimulation occurs which helps the removal of any build-up of swelling. At higher frequencies, of 90-100 Hz, vasodilation occurs and increases the blood flow to the area to help healing. What can Interferential be used for? Interferential can be used to treat a large range of musculoskeletal injuries including those where swelling and muscle spasm are present. Joint pain can also be treated effectively by interferential stimulation. Specific injuries include back pain; frozen shoulder; patellofemoral knee pain; meniscus injuries; sacroiliac joint pain….the list goes on! Laser stands for Light Amplification by Stimulated Emission of Radiation. Laser is pure light which is produced by a series of reactions. There are two types of laser, high powered lasers which are used in industry and engineering settings, with an ouput of up to 100 mW. Low and mid-powered lasers produce up to 50 mW and are the type of laser used in therapeutic treatments. There is no heat associated with laser treatment and so they are sometimes also known as cold lasers. There are two types of laser used in the treatment of musculoskeletal injuries, Gallium Arsenide (GaAs) which is not visible and Helium-Neon (HeNe) which has a lower wavelength and is visible. The settings and dosage used depend on the depth of the injury being treated, the amount of fatty tissue overlying the injured structure and age of the client. Laser appears to be of most benefit in tendinopathy type injuries. What can Laser be used for? Laser is used for the treatment of all kinds of musculoskeletal injuries to help reduce pain, muscle spasm, inflammation and encourage cell reproduction. Research has however shown that Laser may not be as effective as other forms of electrotherapy. This type of therapeutic treatment is used regularly in people with chronic pain conditions. Treatment can either be pulsed electromagnetic fields (PEMF) or static magnetic fields (SMF). What is Magnetic Field Therapy? PEMF uses an alternating current through a coil applicator, whereas SMF uses simple, static magnets. The most common example is the magnetic bracelets and other jewellery which can be purchased from high street pharmacies. Both forms of magnetic field therapy are said to have the effect of decreasing swelling and inflammation. Practitioners of magnetic field therapy believe that to maintain health and for healing, the bodies electromagnetic field must be in balance and the use of magnetic field therapy helps to restore this balance. What can Magnetic Field Therapy be used for? Magnetic field therapy has been shown to be successful in producing analgesia (pain relief) in a number of different conditions including lower back pain and osteoarthritis. However, most studies demonstrating a positive effect on pain are of poor quality and so there is no solid evidence promoting the use of magnetic fields in treating injuries or chronic pain. Pulsed short wave diathermy is a form of electrotherapy, similar to Ultrasound. It is sometimes also called pulsed electromagnetic energy. What is Pulsed Short Wave Diathermy? Pulsed short wave diathermy uses electromagnetic energy to heat the underlying tissues. High frequency, short wave, alternating electrical currents are passed into the muscles, tendons, ligaments etc. As the current alternates between positive and negative, this causes structures within the muscle to rotate in reaction. This friction from repeated movement causes an increase in temperature. This works in a similar way to ultrasound, however, diathermy can be used to heat a larger area and also heats the deep muscles more effectively. On the downside, diathermy units are expensive and can only be used by one person at a time. What can Short Wave Diathermy be used for? Over metal implants such as pins and plates. On the chest of patients with pacemakers. Over the abdomen or back of a pregnant woman. Transcutaneous electrical nerve stimulation (TENS) is a method of providing pain relief. As the name suggests, it involves the application of electrical current to the affected area. This is achieved via a number of electrodes that can be fixed to the skin. TENS relieves pain mainly by stimulating the pain gate mechanism. When tissue becomes damaged, the pain nerve fibres in the area become irritated and increasingly sensitive which leads to a heightened perception of pain in that area. However, in that region, there are also a number of mechanoreceptors which respond to touch. Stimulation of these nerve fibres can override the pain impulses from that area- this is known as the pain gate mechanism. These mechanoreceptors can stimulated by an electrical current at a certain frequency (usually 90-130 Hz) as provided by the TENS machine which in turn causes a pain relieving effect. 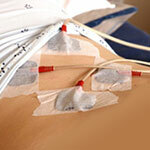 The use of TENS is an extremely popular method of pain relief. It is relatively cheap, easy to use and the side effects are minimal when compared to some oral pain killers. It is thought that TENS can provide pain relief in the region of almost 70% of cases suffering from an acute injury. and are easy to apply. However a certain amount of care should be taken as a small proportion of patients suffer from an allergic reaction to the conductive gel, the electrodes themselves or the tape used to secure them in place. Most newer machines come with self-adhesive electrodes that can be changed after each application to decrease the risk of cross infection if more than one person is using the machine. Most machines offer a frequency of approximately 2-200 Hz. To stimulate the mechanoreceptors the frequency should usually be in the region of between 90-130Hz. The intensity of the current is also adjustable and most machines will be able to reach intensities of between 80-100mA. This setting controls the period of time that electrical current passes through the electrodes. Many professionals place less emphasis on this setting than the intensity and frequency while some machines do not even have this particular control. TENS machines should not cause discomfort but it will be possible to feel a slight tingling sensation when the machine is on. Again, as each person is different adjusting the above settings is highly important to gain the maximal effect from the machine. As with the above settings the position of the electrodes may be varied in response to the individual’s symptoms. Usually, an electrode is placed either side of the painful area however any number of variations may be possible. Some practitioners focus on targeting a particular peripheral nerve or acupuncture point. If the area of skin has abnormal sensation. If the individual is pregnant always seek professional advice prior to using. Application to the neck and upper trunk region. Ultrasound has been used as a treatment modality for sports injuries by therapists over the last 50 years. Ultrasonic waves or sound waves of a high frequency that is not audible to the human ear are produced by means of mechanical vibration in the metal treatment head of the ultrasound machine. The treatment head is then moved over the surface of the skin in the region of the injury transmitting the energy into the tissues. When sound waves come into contact with air it causes a dissipation of the waves, and so a special ultrasound gel is placed on the skin to ensure maximal contact between the treatment head and the surface of the skin and to provide a medium through with the sound waves can travel. Ultrasound can also be applied underwater which is also a medium for ultrasound waves to travel through. The effects of therapeutic ultrasound are still being disputed. To date, there is still very little evidence to explain how ultrasound causes a therapeutic effect in injured tissue. Nevertheless, practitioners worldwide continue to use this treatment modality relying on personal experience rather than scientific evidence. Below are a number of the theories by which ultrasound is proposed to cause a therapeutic effect. As the ultrasound waves pass from the treatment head into the skin they cause the vibration of the surrounding tissues, particularly those that contain collagen. This increased vibration leads to the production of heat within the tissue. In most cases, this cannot be felt by the patient themselves. This increase in temperature may cause an increase in the extensibility of structures such as ligaments, tendons, scar tissue, and fibrous joint capsules. In addition, heating may also help to reduce pain and muscle spasm and promote the healing process. Ultrasound may also stimulate the production of more collagen which is the main protein component in soft tissue such as tendons and ligaments. Hence ultrasound may accelerate the proliferative phase of tissue healing. It is thought to improve the extensibility of mature collagen and so can have a positive effect on fibrous scar tissue which may form after an injury. Ultrasound is normally applied by use of a small metal treatment head which emits the ultrasonic beam. This is moved continuously over the skin for approximately 3-5 mins. Treatments may be repeated 1-2 times daily in more acute injuries and less frequently in chronic cases. Ultrasound dosage can be varied either in intensity or frequency of the ultrasound beam. Simply speaking lower frequency application provides a greater depth of penetration and so is used in cases where the injured tissue is suspected to be deeply situated. Conversely, higher frequency doses are used for structures that are closer to the surface of the skin. Extracorporeal Shock Wave Therapy is a form of Electrotherapy which has shown to be beneficial in the treatment of tendon injuries such as Achilles Tendinopathy and Tennis Elbow, as well as Plantar Fasciitis. Extracorporeal Shock Wave Therapy is a method of therapeutic treatment for soft tissue injuries. It works by passing shock waves (short but intense energy waves) which travel faster than the speed of sound, into the tissues. The form of treatment was originally developed to break down kidney stones and has been used in this way for the last 20 years. It was noticed that patients receiving this treatment also noticed a decrease in pain from other soft tissue injuries. The technology was then adapted to be suitable for use specifically on these areas. What Injuries is it used for? ESWT also encourage bone healing and so can be used for stress fractures. Whilst the exact process is still up for debate, it is thought that ESWT works by causing microtrauma to the tissues which creates neovascularisation – an increase in new blood vessels. These bring an increase in blood flow to the area and therefore aid tissue healing. Beneficial effects may also be down to the stimulation of an acute inflammatory response in a chronic injury. This can effectively re-stimulate the healing process. Extracorporeal Shock Wave Therapy can be either High-level or Low-level energy. Applied in a single dose. Energy levels above 0.6 mJ/m. Used in conjunction with local aneasthetic. Energy levels below 0.08 mJ/m. Less painful – maybe uncomfortable. Local anaesthetic not normally used. Exogen is a bone healing system which is used in treating fractures, especially those which are not healing naturally. It uses ultrasound waves to stimulate bone healing. Exogen uses a low-intensity pulsed ultrasound (LIPUS) signal to stimulate the natural bone healing process. It is a portable device with a small transducer which is placed on the skin over the broken bone. Ultrasound waves pass through the overlying soft tissues to penetrate the bone. It can be used on recent fractures to accelerate the healing time, as well as on non-union fractures (where the bone is not healing). There are currently no known contraindications (when the system cannot be used). Although safety and effectiveness have not been established for children, pregnant women or patients with pacemakers, fractures from bone cancer, poor circulation or blood clotting disorders. 1. Heckman JD, Ryaby JP, McCabe J, Frey JJ, Kilcoyne RF. Acceleration of tibial fracture-healing by noninvasive, low-intensity pulsed ultrasound. J Bone Joint Surg Am 1994;76:2634. 2. Kristiansen TK, Ryaby JP, McCabe J, Frey JJ, Roe LA. Accelerated healing of distal radial fractures with the use of specific, low-intensity ultrasound.J Bone Joint Surg Am 1997;79:96173. 3. Nolte PA, van der Krans A, Patka P, Janssen JMC, Ryaby JP, Albers GHR. Low-intensity ultrasound in the treatment of nonunions. J Trauma 2001;51:693 703.